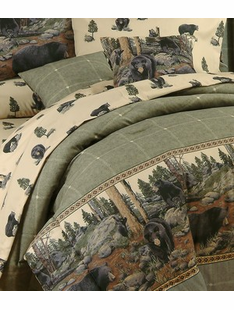 The Burly Bear's The Bears Bed Sets feature Black Bears roaming the panoramic scenic border. The field of the comforter is soft sage plaid color. Detailed jump tack stitching enhances the comforters design, Comforters are oversized. 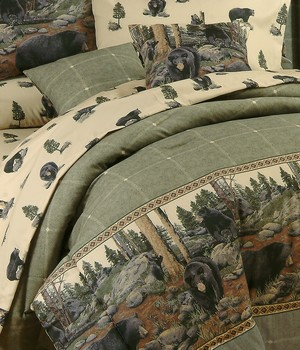 The Bears will bring a bit of woodland magic to your home, cabin, lodge, or apartment in the city!